These days, people have something plugged into almost every electrical outlet in the house. Toasters, tea kettles, computers, widescreen TVs, cell phone chargers – you name it and it’s probably plugged-in. People use more power than ever before and so houses built recently have electrical service that can handle all that load – but it didn’t use to be that way. Houses built today have 100-amp electrical service, but many older houses just had 60-amp service. That was good enough back then, but it’s might not be adequate now. A caveat: this article pertains to houses and not conventional condominiums. Conventional condominiums are typically insured as a whole by the condo corporation. So if you live in an apartment condo or a townhouse, the service requirements may be different for building insurance. If you live in a house that was built in Edmonton during the turn of the century – the last century that is, your house probably had only 30-amp service. That wouldn’t really even run a toaster and an electric cook-top at the same time these days. Using a blow-dryer and kettle at the same time would blow a fuse. That 30-amp electrical service was common until the early 1940s when builders changed over to 60-amp service and by now all 30-amp systems in Edmonton should have been replaced with at least 60-amp service. 60-amp service wasn’t that bad back in the 1950s if you have a gas stove and gas dryer and most people did have a gas stove – and they hung their laundry to dry or maybe had a gas dryer – which worked perfectly fine. This doesn’t often suffice today, however – nowadays you really should have 100-amp service for insurance and for future use. For example, what if you want to change your stove to electrical? What is your gas dryer breaks or you’re wanting to switch to an electric one? 100-amp service started to be used in homes by the late 1950s, so if your house was built before then, it may have been 60-amp service. So why is this all so important? Well I think pretty much no one has 30-amp service anymore, so you can forget about that being a problem, but since there was such a construction boom just after World War II, there are a lot of houses built in the 1940s in Edmonton and a lot of them have a lower amperage electrical service than is required today. And that in itself may not be such a big deal – your house might be fine – but what you have to consider is the insurance companies. Many insurance companies have decided that 60-amp service is not as safe as 100-amp service, and they often won’t insure a property with a 60-amp panel. They won’t just charge you more – they often won’t insure it at all! Some insurance companies might give you temporary insurance as long as you update the electrical in a reasonable amount of time, but it could depend. This is a big pain for a new homeowner because without insurance, you can’t have a mortgage and without a mortgage, you often can’t have a house! What are you supposed to do? Well unless you can get some leeway from the insurance company, you’re going to need to upgrade that panel quite soon after you move in or the sellers will have to upgrade if for you. Insurance companies often won’t insure a property with a 60-amp electrical service. So how do you know what a house has? Well an electrical panel can be located in a few different places – it’s usually at the back of the house in the basement or near the back door. If you have a newer detached garage, sometimes the panel is in there instead. This is not common with older houses, though, unless the upgrade has already been done. Make sure to locate this panel and check what the electrical service is. 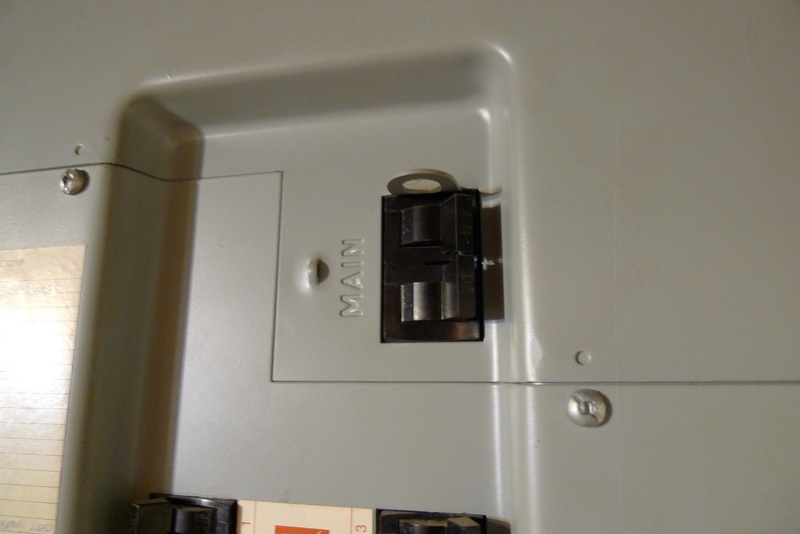 If there is only 60-amp service, the main breaker will say ’60’ on it. If it’s 100-amp, it’ll simply say ‘100’. Pretty easy. This isn’t to say that you shouldn’t get a house inspector when you buy a home, I think you should, but you can check the breaker yourself in advance. 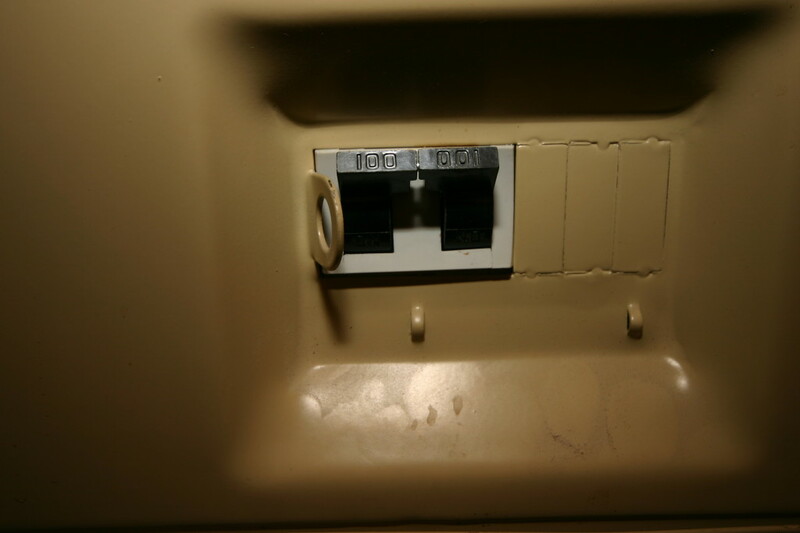 An electrical panel with a 100-amp main breaker. And here’s what a 60-amp breaker looks like. Not easy to tell the difference, so look carefully! An electrical panel with a 60-amp breaker. Look closely for the numbers, they can be hard to read! If you’re a homeowner and haven’t already upgraded your electrical, it might be a sticking point for a buyer down the road. Wouldn’t it be so cool if you could put a new box on the wall and hook up your power-line and get 100-amp service? That would be so nice! Unfortunately, that’s not how it works. The problem is that you have a certain gauge wire running from the power pole out back to your home, and that line needs to be updated to carry the extra current to your house – the old one won’t cut it. And you might need to update all sorts of other items when you get this new service. It’s not a do-it-yourself project. You can’t go unhooking power-lines and digging up the yard to get your panel upgraded – you need a master electrician for that. All in all, upgrading your panel can costs in the thousands so it’s not cheap, but it will make the home more liveable and saleable. If you’re a homeowner and haven’t already upgraded your electrical service to 100-amp, you might want to budget for it as it might be a sticking point for a buyer down the road. If you’re a new buyer and the home hasn’t been changed to 100-amp already, it will almost certainly have to be done at some point -and likely soon – so call around to get the details, budget for it in your offer or perhaps you can negotiate to have the seller do it before you take possession. Here is a new electrical panel in a 1920s house in Edmonton. You can see the service come in on the top left. Homeowners’ electricity needs have changed over the years, but it seems that 100-amps has been sufficient for some time now. New homes built today still have 100-amp service, so it’s a good bet that if you change your service over, you won’t have to worry about it as long as you live in your home. I know some people opt for 150-amp breakers thinking that they might need more power in the future, but with more efficient appliances and lighting, it doesn’t seem to be a problem in Alberta thus far. If you live in a condo, you probably don’t have to worry about the electrical service in your place with regards to insurance. Because a condominium is insured as a whole, the service to each unit is not typically a concern. 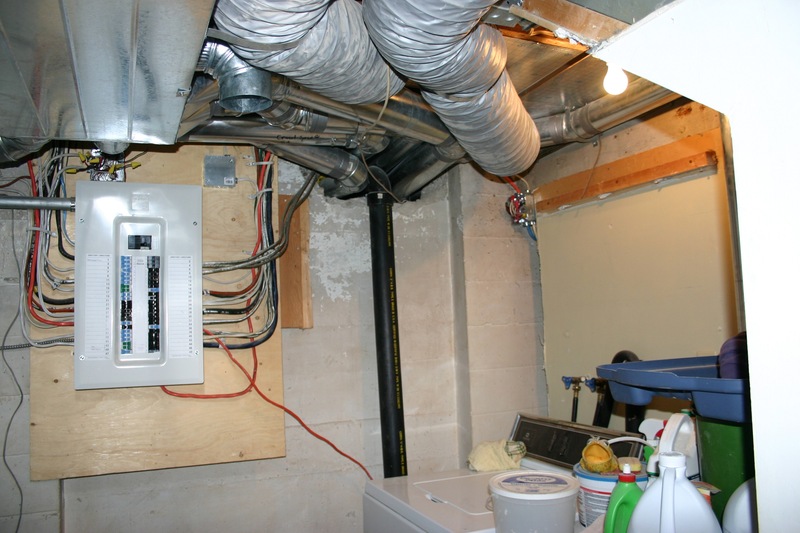 Any changes to the electrical load of the condo unit could cause problems however – like if an owner wants to add laundry to a unit that doesn’t have it. Otherwise, 60-amps or even 50-amps may be perfectly adequate. Make sure to check with your home inspector about the electrical service when you get your inspection and if you or the inspector has any concerns, contact a qualified electrician to find out if anything needs repair or upgrading. Hello Alan. My name is Peter and I live in Edmonton ( Dovercourt). I live in a 1954 home with a 70amp. breaker. I am getting a new garage built soon , and I would also like to upgrade to 100 amp at this time. Would it be allowable by code to put my new panel in the garage and feed ( underground) to my house panel which is in my kitchen at the rear of the house ? I would much prefer this , rather than having to get a mast installed on my house and major reno to deal with for having a panel in my basement. Hi Peter. That is exactly how it is usually done. Because you need to trench from the garage to the house anyway, it makes the most sense to have the service enter at the garage first. You may be able to use your old kitchen panel, but usually people put the panel in the basement where the power will enter anyway – that way you can have more breakers. The small panels just aren’t usually enough these days. Then you can expand any time you want and make sure that the kitchen is up to code with its dedicated plugs and all. Even your furnace needs to be on a dedicated breaker. Your electrician will let you know what your options are of course. We will be doing the same thing when we build our garage. We have a house from the 1950s as well. Hi, this is all good information. I have a triplex with each apartment unit wired for 60-amp service. And as you said, insurance wants 100 amps. BUT the only significant load in the apartments is the electric stove. The building is centrally heated and air conditioned and the laundry is common in the basement. All of that stuff runs off our common house circuit, which I pay as the landlord. I believe the common circuit is 100 amps. Why would the insurer deny insurance for apartments that only have a stove?? A fridge, phone charger and LCD TV don’t draw much. Any thoughts? I don’t know where you are located, but every area is different. 60 amps was fine when we had gas dryers (or just a clothesline) and a gas range. The insurance companies consider 60 amps to be dangerous. Honestly, I don’t think it is – but I am not an insurance adjuster or an electrician. 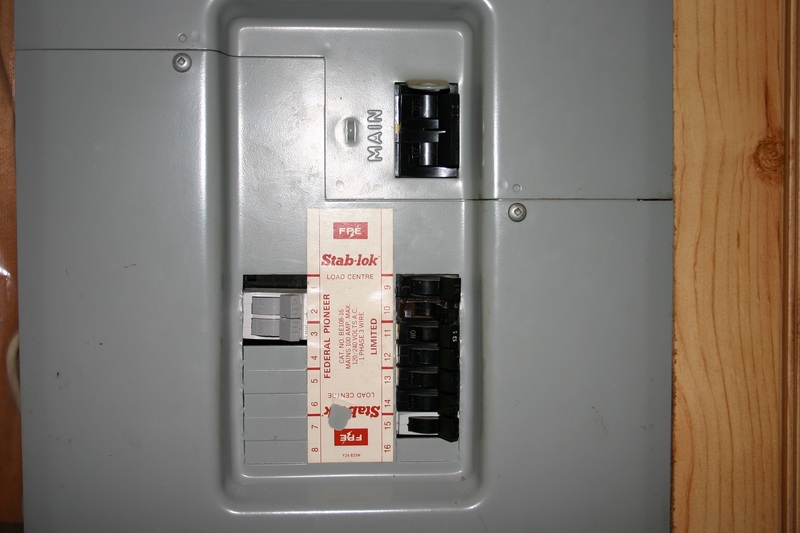 I think the most common issue is going to be a tripped breaker, but every company has a set of rules they follow and 60 amp main breakers are something they don’t want to cover. I am not sure if your setup would actually be a problem but the company is following a checklist, not thinking about how little you’re actually drawing on the system. We had a 70 amp main breaker in our condo and no one cared because we didn’t have insurance for the building under our policy – just coverage for our unit’s contents and improvements. The main policy for the building covered the wiring. That said, we could trip a breaker if the stove had an element on, the oven was on and the dryer was running. We just learned not to do that. You may find a company who will listen to your argument that 60 amps is fine for your setup – maybe it really is. Call around and see if anyone will give you insurance for your triplex as is. I like that you mentioned that upgrading your electrical may be a selling point for your home down the road. A house is definitely an investment, and my wife and I want to get the most out of it that we can. Today’s home market isn’t fantastic in my area, so anything that can help a home to sell while benefiting me in the meantime sounds like a great idea. We live in a condo with 60 amp service, we replaced all the old appliances with new modern ones. Since moving here I’ve had issues with the oven, it seems to take a long time to come up to temp. And my pies are not turning out as with the 100 amp we had, even the cooking time is longer. Any suggestions. Thank you. Your service won’t cause this issue. The breakers just trip when you have an overload, they don’t prevent an oven from heating up. My guess is that the oven you have now is not as good as the one you had previously.